Measurements: 80 cm L x 66 cm W x 34.5 cm HStarting from the base, the trap is constructed on four bottom-boards, 80 cm long, 7cm wide, and 1.8 cm thick parallel to each other. These are laid out so that the outer edges of the two outer bottom-boards are 66.0 cm apart, and the two inner boards are spaced equidistant from the outer boards, and from each other. Across these bottom-boards, at each end and in the centre, are three boards 66.0 cm long, 6.5 cm wide, and 2.8 cm thick. Near the ends of these cross members holes have been drilled to accommodate a wooden semi-circular hoop. The holes are centred 58cm apart on the cross members. The three hoops are made from tree branches approximately 3 cm diameter, with the bark retained. The ends of these hoops have, where necessary, been whittled to fit the holes at their thicker ends. Once fitted to the cross members the hoops adopt a semi-circular, arch shape about 34.5 cm tall. All three hoops have their thicker end to the right when facing the Kitchen end of the trap. Laid on the bottom boards are flat beach stone weights of sufficient size so as not to slip through the bottom boards. Two are under the Kitchen, one under the Parlour. On top of the cross members, parallel to the bottom boards, and inside the hoops, are a series of 7 wooden laths that form a floor to the trap. These are 80 cm long, 4.0 cm wide, and 1.0 cm thick. There is about 4.0cm space between the laths. Across the trap floor between the ends of each hoop is a 1.5cm wide, 1.00 cm thick lath. The purpose of these thin laths is to retain the bottom ends of the netting that forms the two ends of the trap, and the divider between the “Kitchen” and the “Parlour” sections. Laid on top of the ends of these net retainers and abutting the hoops are two more laths running the length of the Kitchen. These retain the bottom of the netting that forms the two funnels leading to the doors. At the Parlour end of these two laths they have been crudely broken, rather than sawed. Laid on the outside of the hoops and running the length of the trap, are two laths similar to those that form the floor. The outside of the hoops are covered with laths similar to those used for the floor, and spaced in the same way, 4 cm apart. They are not continuous over the length of the trap. The Parlour is completely covered by spaced laths. Counting clockwise from the base, there are 5 laths between the Parlour end hoop and that dividing the Parlour from the Kitchen. The first is 4cm from the top of the horizontal lath laid outside the hoops. This spacing allows egress for small lobsters that are not of legal catch size. Theoretically, since the spacing is the same between most of the covering laths, such lobsters could exit the Parlour at any height. Laths 6 through 12 run the full length of the trap, and the remaining 5 only between the Parlour end hoop and that dividing the Parlour from the Kitchen. This results in the parlor being completely roofed with laths, and the kitchen having rectangular openings from the floor to about half way up the hoops. Laths 5 and 12 are doubled, the top of the netting forming the funnels to the doors being sewn to the lower lath 5 and 12 in the Kitchen area. The upper laths protect the cords fastening the funnels to the lower laths from accidental damage. In order for the Parlour to be emptied of trapped lobsters, and to give access to the bait area of the Kitchen, the top of the trap is an access hatch. This is made from the laths 7 through 10, lath 7 being laid abutting lath 6, and lath 10 abutting lath 11; with about 0.5cm gap between laths 6&7 and 10&11. The hatch is held together by 25 cm long, 3 cm x 3 cm thick carved wooden formers that follow the curve of the hoops, and are placed adjacent to them. The hatch is hinged so as to open outwards and upwards, away from the fisher emptying or baiting the trap. The hinges are two strips of cloth covered rubber set diagonally across the 10th and 11th. laths. The hinges are 8.0cm long, 2.5 cm wide, and 0.4cm thick. A rectangular piece of tire material fastened to slat 6 acts as a closure catch for the hatch, resting on lath 7. The catch is opposite to, and centred between, the hinges. The hatch is prevented from falling into the trap by the hoops. All wood construction is fastened by flat head steel nails. Those used to fasten the hinges and catch are zinc coated. All the remainder are rusted. The end hoops are covered by green netting made from two ply cord 1.0mm thick. The netting is 3.5cm x 4.4 cm mesh, and is sewn onto the end hoops with white two ply cord. The Parlor is divided from the Kitchen by a similar net in a funnel shape, the funnel opening into the Parlor from the Kitchen. This funnel is held open by cords fastened to the end hoop at laths 5 and 12. These cords are attached to two knots of the mesh about 3.0cm apart at each end of the top of the funnel, so as to form an elongated V shape in each cord. The netting at the base of this funnel is looped around the thin lath laid across the floor of the trap at the centre hoop. Immediately in front of this thin lath is the bait spike. This is a zinc-coated nail 22 cm long, 1.2 cm diameter driven vertically up from the bottom of the centre lath of the floor. Tied to the top of the centre hoop above the bait spike and the base of the spike is a cord on which runs a 5.0cmx4.5cm piece of tire. This is the bait retainer. It has a hole so that it can be placed on the spike after the bait has been put on. The rectangular openings at the lower sides of the kitchen are fitted with net funnels and doors (heads). The doors are black plastic rings, 14cm in diameter, 1.3 cm thick, closed by a retaining sleeve. The funnels are 20cm deep, and fixed at the outer edge to the floor and top (laths 5 and 12), and to the front and centre hoops, by cord. The funnels are made from the same netting as the funnel between the kitchen and the parlor. The rings of the doors are threaded onto the funnel netting. The door rings are held vertically 22cm above the floor by cords. Measurements: 80 cm L x 66 cm W x 34.5 cm H x 80 cm L x 66 cm W x 34.5 cm HStarting from the base, the trap is constructed on four bottom-boards, 80 cm long, 7cm wide, and 1.8 cm thick parallel to each other. These are laid out so that the outer edges of the two outer bottom-boards are 66.0 cm apart, and the two inner boards are spaced equidistant from the outer boards, and from each other. Across these bottom-boards, at each end and in the centre, are three boards 66.0 cm long, 6.5 cm wide, and 2.8 cm thick. Near the ends of these cross members holes have been drilled to accommodate a wooden semi-circular hoop. The holes are centred 58cm apart on the cross members. The three hoops are made from tree branches approximately 3 cm diameter, with the bark retained. The ends of these hoops have, where necessary, been whittled to fit the holes at their thicker ends. Once fitted to the cross members the hoops adopt a semi-circular, arch shape about 34.5 cm tall. All three hoops have their thicker end to the right when facing the Kitchen end of the trap. Laid on the bottom boards are flat beach stone weights of sufficient size so as not to slip through the bottom boards. Two are under the Kitchen, one under the Parlour. On top of the cross members, parallel to the bottom boards, and inside the hoops, are a series of 7 wooden laths that form a floor to the trap. These are 80 cm long, 4.0 cm wide, and 1.0 cm thick. There is about 4.0cm space between the laths. Across the trap floor between the ends of each hoop is a 1.5cm wide, 1.00 cm thick lath. The purpose of these thin laths is to retain the bottom ends of the netting that forms the two ends of the trap, and the divider between the “Kitchen” and the “Parlour” sections. Laid on top of the ends of these net retainers and abutting the hoops are two more laths running the length of the Kitchen. These retain the bottom of the netting that forms the two funnels leading to the doors. At the Parlour end of these two laths they have been crudely broken, rather than sawed. Laid on the outside of the hoops and running the length of the trap, are two laths similar to those that form the floor. The outside of the hoops are covered with laths similar to those used for the floor, and spaced in the same way, 4 cm apart. They are not continuous over the length of the trap. The Parlour is completely covered by spaced laths. Counting clockwise from the base, there are 5 laths between the Parlour end hoop and that dividing the Parlour from the Kitchen. The first is 4cm from the top of the horizontal lath laid outside the hoops. This spacing allows egress for small lobsters that are not of legal catch size. Theoretically, since the spacing is the same between most of the covering laths, such lobsters could exit the Parlour at any height. Laths 6 through 12 run the full length of the trap, and the remaining 5 only between the Parlour end hoop and that dividing the Parlour from the Kitchen. This results in the parlor being completely roofed with laths, and the kitchen having rectangular openings from the floor to about half way up the hoops. Laths 5 and 12 are doubled, the top of the netting forming the funnels to the doors being sewn to the lower lath 5 and 12 in the Kitchen area. The upper laths protect the cords fastening the funnels to the lower laths from accidental damage. In order for the Parlour to be emptied of trapped lobsters, and to give access to the bait area of the Kitchen, the top of the trap is an access hatch. This is made from the laths 7 through 10, lath 7 being laid abutting lath 6, and lath 10 abutting lath 11; with about 0.5cm gap between laths 6&7 and 10&11. The hatch is held together by 25 cm long, 3 cm x 3 cm thick carved wooden formers that follow the curve of the hoops, and are placed adjacent to them. The hatch is hinged so as to open outwards and upwards, away from the fisher emptying or baiting the trap. The hinges are two strips of cloth covered rubber set diagonally across the 10th and 11th. laths. The hinges are 8.0cm long, 2.5 cm wide, and 0.4cm thick. A rectangular piece of tire material fastened to slat 6 acts as a closure catch for the hatch, resting on lath 7. The catch is opposite to, and centred between, the hinges. The hatch is prevented from falling into the trap by the hoops. All wood construction is fastened by flat head steel nails. Those used to fasten the hinges and catch are zinc coated. All the remainder are rusted. The end hoops are covered by green netting made from two ply cord 1.0mm thick. The netting is 3.5cm x 4.4 cm mesh, and is sewn onto the end hoops with white two ply cord. The Parlor is divided from the Kitchen by a similar net in a funnel shape, the funnel opening into the Parlor from the Kitchen. This funnel is held open by cords fastened to the end hoop at laths 5 and 12. These cords are attached to two knots of the mesh about 3.0cm apart at each end of the top of the funnel, so as to form an elongated V shape in each cord. The netting at the base of this funnel is looped around the thin lath laid across the floor of the trap at the centre hoop. Immediately in front of this thin lath is the bait spike. This is a zinc-coated nail 22 cm long, 1.2 cm diameter driven vertically up from the bottom of the centre lath of the floor. Tied to the top of the centre hoop above the bait spike and the base of the spike is a cord on which runs a 5.0cmx4.5cm piece of tire. This is the bait retainer. It has a hole so that it can be placed on the spike after the bait has been put on. The rectangular openings at the lower sides of the kitchen are fitted with net funnels and doors (heads). The doors are black plastic rings, 14cm in diameter, 1.3 cm thick, closed by a retaining sleeve. The funnels are 20cm deep, and fixed at the outer edge to the floor and top (laths 5 and 12), and to the front and centre hoops, by cord. The funnels are made from the same netting as the funnel between the kitchen and the parlor. The rings of the doors are threaded onto the funnel netting. The door rings are held vertically 22cm above the floor by cords. Narrative: Ramey Munroe had a fishing business based on Sober Island for many years, retiring in 2012. The Georeference is for the wharf he built there for that business, and where the shed beside which this Trap was stored is located. Lobsters have been a traditional food source for the Mi’kmaq and Maleseet indigenous peoples of Atlantic Canada since before European contact. They were first caught by spearing, or simply gathered from the shore at low tide, or after a storm, as they were so abundant as to be crawling at the water’s edge. So abundant were lobster that they were not regarded as the luxury they are today. Indeed, they came to be seen as food of the poor! As sale for profit was introduced, lobsters without spear marks commanded a higher price than damaged ones. Trapping lobsters became the favoured method of harvesting them. Wire cages used by European fishermen to catch crayfish were adapted as the first lobster traps. In that regard, history has come full circle, as wooden traps are now being replaced by plastic coated wire mesh traps. 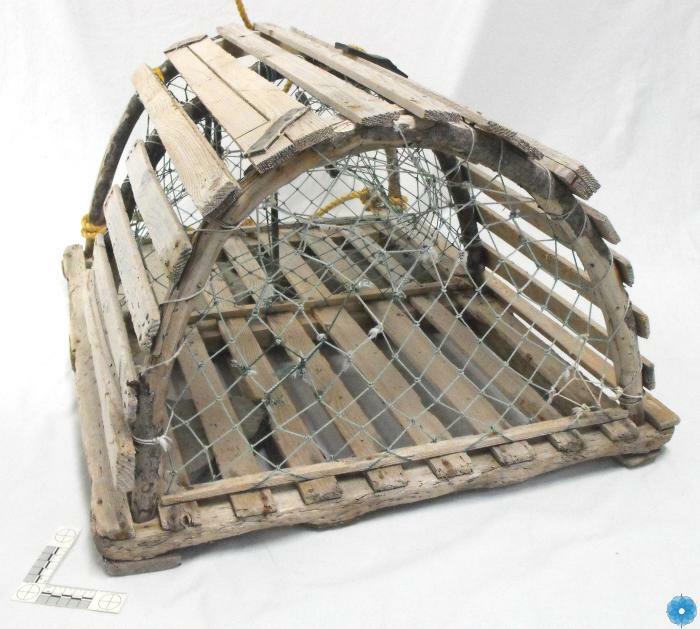 The hoop and lath trap is said to have originated in the Cape Cod area, and to have been introduced by American lobster canning companies to the Canadian Maritime provinces. In the earliest hoop and lath traps the hoops were made from old wagon wheels. Mr. Munroe has employed tree branches, and commercial hoop traps have machine cut, steam formed hoops. The traps operate by taking advantage of the instinctual flight behaviour of the lobster. This article from Scribner’s Monthly of 1880 explains the principle. Double Headed Trap (Scribner's Monthly, 1880) North American lobster traps are based on the lobster pots used for centuries in northern Europe. Simple in concept, they are one of the most elegant pieces of fishing gear ever invented. Lobsters enter the trap through a wooden ring called a "head". Once inside, the trap simply takes advantage of the lobster's natural instincts. When feeling threatened, a lobster will face the world with its claws spread wide - making it very difficult to walk out the way it came in. When feeling panicked, a lobster likes to flee backwards by flexing its powerful tail. Either way, once in the trap, most lobsters have little chance of finding a way out. Mr. Munroe’s lobster trap is double headed, the lobsters gaining access to the bait from both sides, not just from one end as in the early traps. The door is a ring held more or less vertically, large enough for a lobster to crawl through easily. These rings were originally made from supple twigs bent to a circle and tied with cord, after the netting of the funnel had been threaded onto it. Hard rubber or plastic replaced the use of wooden rings. Although ready made traps were, and are, available commercially, Mr. Munroe saved that expense by constructing his own from materials to hand, or purchased from a hardware store. The plastic door rings he would have purchased, as well as the nails, but it is reasonable to suggest that all the lumber used could have been produced from trees on his property; Mr. Munroe being an accomplished carpenter. Rubber from old tires has been available for secondary uses for decades before this trap was built. The hinges of the access hatch for placing the bait and removing the lobsters are made from such tire rubber. The department of Fisheries tag attached to the trap references Mr. Munroe’s Lobster fishing license, the species to be caught, and the fishing area 32A. Control of the lobster fishery for sustainability requires limiting the number of traps set, as well as the minimum size of the lobsters retained. The design of all traps includes provision for very small lobsters to escape, and a government mandated measuring gauge on the fishing boat is used to ensure that undersized lobster that did not escape the trap are identified and released when the trap is hauled up and emptied. Regulation of the fishery dates back to the 19th. Century. Government introduced restrictions on the use of soft-shelled lobsters and berried females as well as size restrictions in 1871. A year later they restricted fishing in July and August. This trap has a bait spike onto which pieces of fish are placed. The method of baiting that is replacing this is the use of a perforated plastic cup with a screw-on lid. Bait is placed in the cup, and the cup placed in the trap Kitchen. This gives an altogether faster turnaround time for hauling and re-setting the trap. The same odiferous fish pieces are used to attract the lobster to the trap. Traps are usually set where there is a rocky bottom, since lobsters prefer that environment. The depth of water varies, but lobster fishing is essentially an inshore fishery. The flat beach stones used in this trap are ballast to ensure the trap sinks to the seabed, and stays more or less where it is put. The float is attached to the trap by sufficient line to accommodate tidal fluctuations and the vagaries of wind and waves. The line is gaffed at the float by a crew member, placed on a pulley slung from the side of the boat, and hauled in, raising the trap. This is not light work, even with powered winches to haul in the trap. The trap is emptied, re-baited and re-set while the boat continues slowly making way over the desired placement area for that trap. So it is not slow work either! "Fishermen's Tales" are notorious for their exaggeration. However, a local lobster fisherman told this cataloguer that the largest lobster he ever hauled in was clinging to the outside of the trap, covering most of the top and one side! He estimated that it weighed 50lbs ( about 23 Kg)! History of Use: Used by the donor in his fishing business from construction in 1950 to end of useful service in 1970. Stored on-shore until to the museum.